Simon is taking about half of his feedings by mouth and the other half by feeding tube now. He’s been really good about finishing his bottles for me and enjoys his pacifier. Simon is up to 4 pounds 15 ounces. Simon and I had a good time yesterday. After his mid-afternoon feeding, he decided to stay awake for about an hour and a half. The nurse collected a mirror toy and after watching “the baby” and listening to music, he came back out of his bed and played with a key rattle and I rocked him to sleep. His yawn was precious and offered the chance to show off his newly acquired double chin. It really was a great day. I enjoyed spending time with Simon. He’s definitely turning into an infant. Wonderful changes to see. I’m making a quick blog-by as I’m headed back to Denver today. I’ll be there for two weeks by myself before Rob and Jaden make their way down. Rob will be finishing up things in our home during this time. Simon is doing great! He’s on low-flow oxygen at 50cc. He’s up to 4 pounds 10.5 ounces or 2112 grams. He’s cruising right along – and we are too!! Simon is 3 months old today and if I were still pregnant, I’d be 37 weeks in gestation. I’ll be back in Denver and back to my regular posting schedule there. I will also share new pictures after I take them this week. 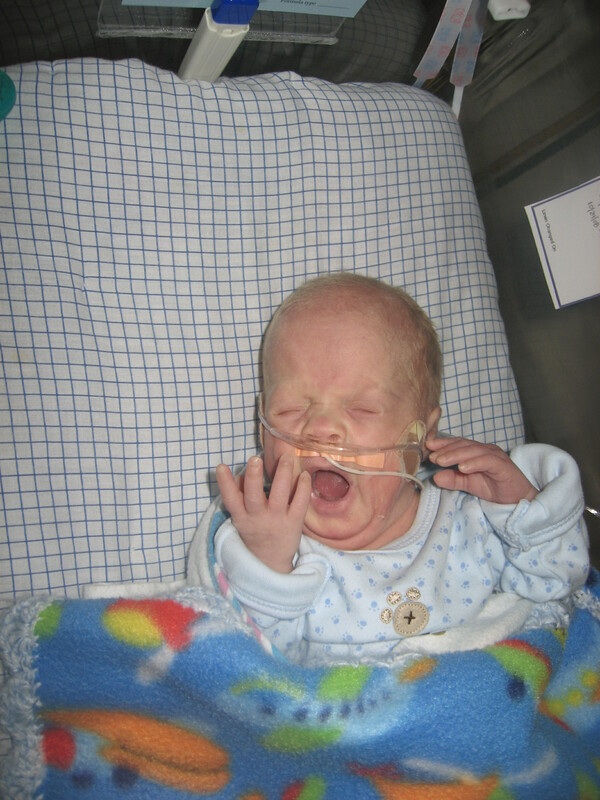 There is much stress associated with the NICU journey. This week was sanity-free and stressful! Saturday, Rob’s grandmother passed away and he went to Kansas for the funeral, along with his parents, brother, etc. It was a great trip for them, given the circumstances. Plenty of laughs and even more food. The stories of rememberance Rob brought back were beautiful! Meanwhile, I was working on getting everything ready for Simon. It’s still not done! There is one room left to scrub down and all the floors/furniture needs to be cleaned. Toys still need sorting in the boys’ room. That’s a huge chore in and of itself. It will get there, but not by me, and not today. I had surgery on Wednesday. We opted for a tubal ligation, no more babies in our future. Not that we don’t love them, we just know that going through another challenged pregnancy and more than likely premature delivery would be detrimental to the sanity of ourselves, friends and family. As this week has progressed, Jaden had a check-up and needed a referral to an ENT because of his snoring issues. We are leading to believe that his sleep apnea is back (some late nights of coffee will help determine that) as his tonsils are enlarged and of course, horrible snoring and dark circles under his eyes. Jaden is taking a couple different medicines to see if that will help (allergy related) and we’ll go from there. The other event that transpired with Jaden was a murmur being heard. Since Jaden hasn’t had a murmur before in his life, we’ve been referred to Children’s Hospital in Denver. Yep – the hospital right next to Simon’s. Jaden will have that appointment on Nov 4. Fortunately Simon is doing well. He weighed in at 2020 grams or 4 pounds, 7.25 ounces last night. His oxygen is on .5L and sitting around 40%. His nippling well. We are on our way with him. I’ll be heading back to Denver next week. Which day, I’m not sure. I’m missing Simon terribly and can’t wait to get back to see him!! He’s grown and changed so much in the last week, I’m sure that I’ll be shocked to see all the differences!! I’ve been home since Wednesday. I’m not headed back to Denver until Sunday or Monday. I will have a tubal ligation done Wednesday. I signed the rest of those documents this morning. Hoorah! There’s no more babies in our future. The journey with Simon has reaffirmed that decision. I’ve spent the greater part of a week preparing for Simon’s home coming. Walls are cleaned, baby items are put together, cleaned down and waiting for Simon in a designated place. It’s been a challenge down-sizing certain posessions to make room for everything. I’m glad to be near finished with the projects at hand. Carpets being cleaned will occur sometime before Simon’s home-coming as well. There are a few items that we still need to get for Simon and will probably do so in the coming weeks. Fortunately there isn’t a great deal that we are lacking. 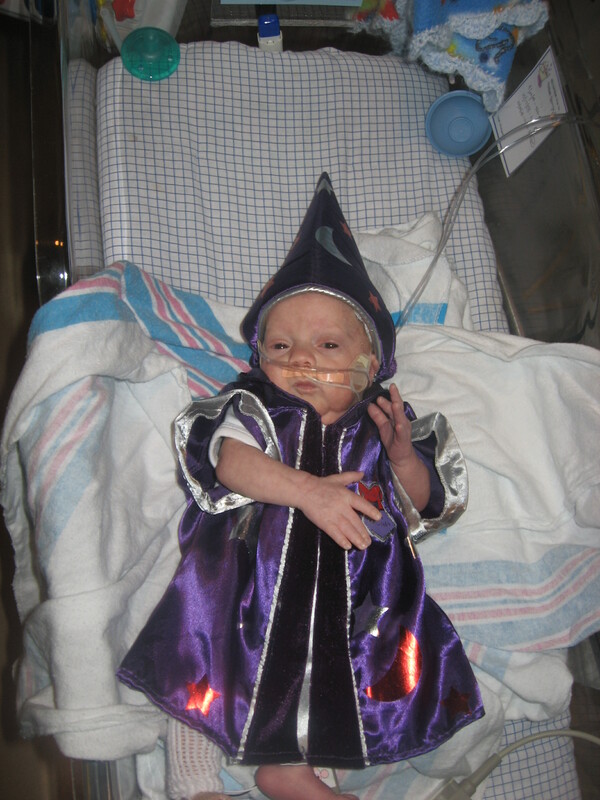 Simon is rockin’ and a rollin’ in the NICU. He’s up to 4 pounds 3 ounces and nearly 16″ long. 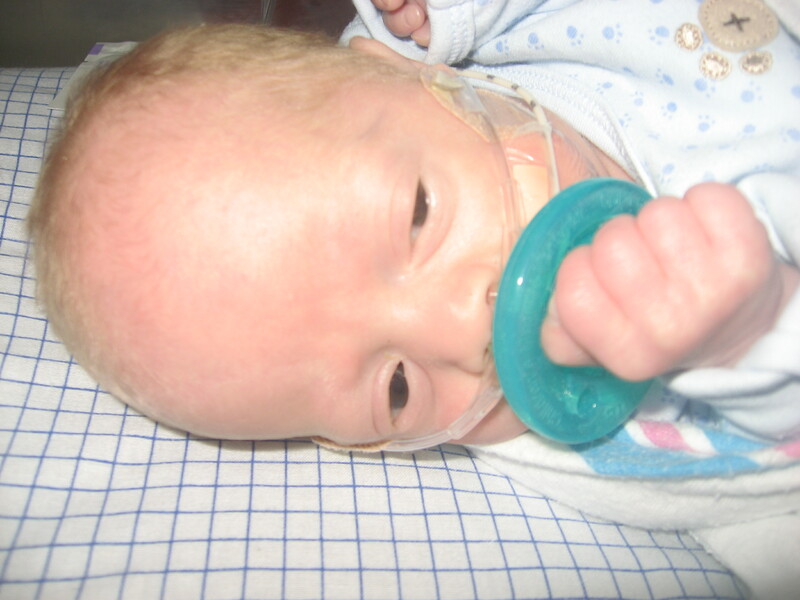 His oxygen flow has gone from two liters to one and he’s staying on course with feedings. The days are moving so quickly and Simon will soon be home with us. Simon is now 12 weeks old and I would be 36 weeks in gestation. What amazing progress through the weeks. Simon at three pounds fourteen ounces took his first bottle today! He did remarkably well and took half of his feeding!! 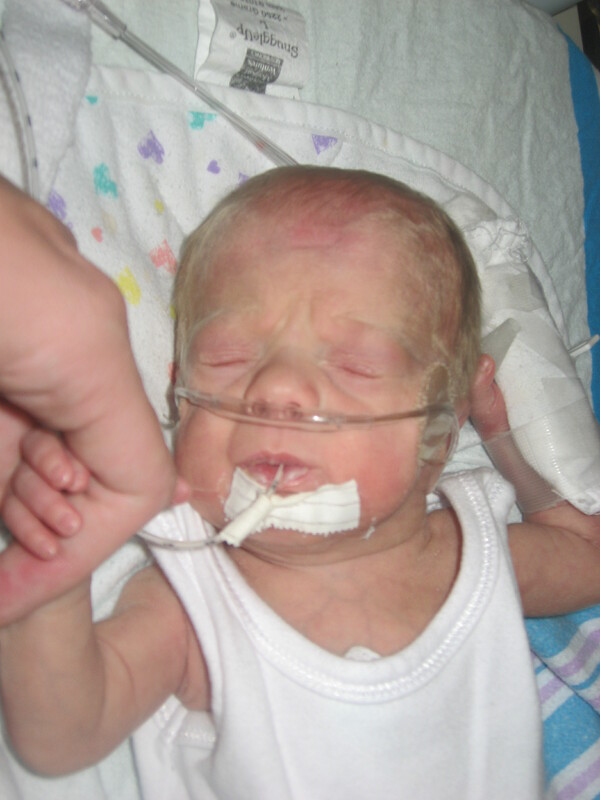 For preemies, there’s much work that comes with bottle feeding and those 17mL wiped Simon out. He will now be taking one bottle a shift, working up to full feeds by mouth. Oxygen is vital to survival. Simon has gone from ventilator to CPAP to high flow oxygen. His O2 rate was reduced today from 2L/minute to 1.5L/minute. He will soon be progressing to low-flow oxygen! The two events of today are bringing us that much closer to Simon coming home – to stay! Simon is off the CPAP!!!!!!!!!! He was moved to High-Flow oxygen today at 2 liters. Here’s a picture of his first moments without the mask. Simon is now on a CPAP rate of 4 and tolerating that well. We’ll see how the next few days go with that and we’ll be back on target with nippling and working towards full feedings. Simon will also be able to move into an open crib in 7 more ounces while on high flow oxygen. Step by step we are getting there.